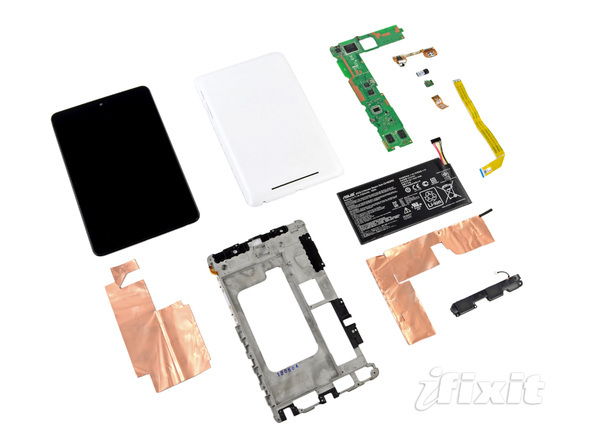 iFixit has given the latest and greatest Android tablet, the Nexus 7, the old tear down treatment that they give to all of the new gadgets that come out. Luckily for everyone planning on buying the device, the site gave the 7″ tablet an impressive repair score of 7 out of 10 (10 being the best). For reference, they gave the new iPad a score of 2 out of 10. The whole device can be torn down with one screwdriver and the guys report that everything comes apart rather easily. The battery can also be swapped out with minimal effort, the only problem is that the display and the Corning glass protecting it cannot be separated. If you like to see nice gadgets get filleted open for viewing, hit the source link below.